+ Module 1: I’ll show you how to find a niche where you can be the big fish in a small pond. You will learn how to find profitable niches and how to identify one to stay away from. Picking the wrong niche is a fast way to go out of business. + Module 2: I’m going to show you how to setup your bank account payment processing and back office create branding, marketing materials, proposals and contracts, and find, hire and manage VAs. + Module 4: Now that you have a client it’s time to impress them with your results. I’ll show you step-by-step how to get results and how to clearly communicate the results to the client with numbers they can understand. I’ll teach you how to upsell client to web hosting, autoresponder, website design, email marketing, and webinars with the highest returns and least amount of work for you. + Module 6: Multiple Client can be alot to manage, but I’ll teach you simple strategies to managing your clients without dropping the ball. Keep your client happy without pulling your hair out. + Module 7: Reporting is a necessary evil, but it does not have to be burdensome or difficult. I’ll show you how to setup your reporting so it only take 7 minutes per week per client to send them reports that give them the high level numbers they need to see. + Module 8: VA’s and outsourcers are wonderful resources and can save you lots of time while adding so much money to your bottom line. 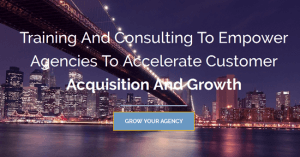 I will show you how to use your VA’s and outsourcers to scale up your agency to handle more clients and offer more value-added services to get bigger and bigger clients.